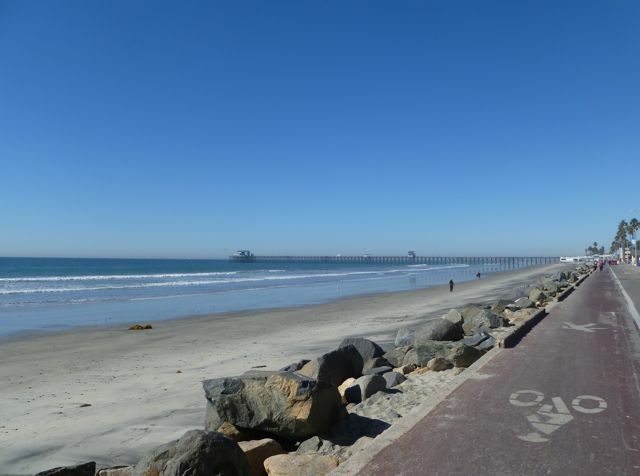 Of the places that I cycled while doing the research for enCYCLEpedia, Oceanside was one of the biggest surprises. In fact, for an easy scenic cycling destination, it had enough great features to earn a high 4 star rating. 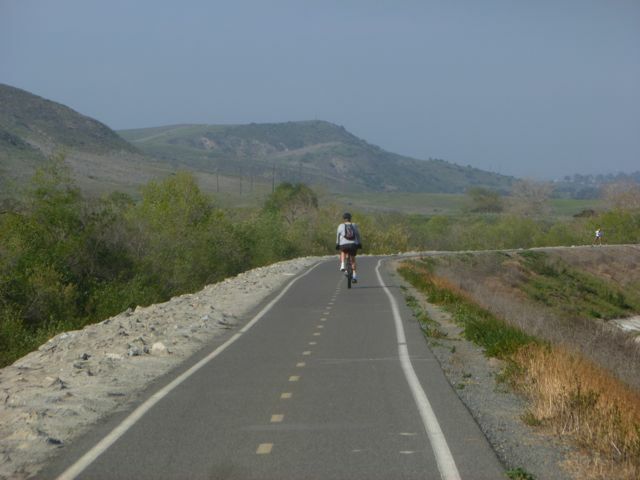 The highlight is the 9-mile San Luis Rey River Trail that mostly follows a levee along its banks. Reach it from Pacific Street just southeast of Oceanside Harbor, or from the northwest end of Cleveland Street (west on Neptune) downtown. Like most SoCal rivers you won’t see much water in the San Luis Rey most of the year except for the tidal delta, but it traverses a lovely riparian corridor through a low density residential valley. There’s no speed limit on the trail, so you can get a great workout as long you’re careful around pedestrians. On-shore breezes can make your return strenuous, typically more towards afternoon. 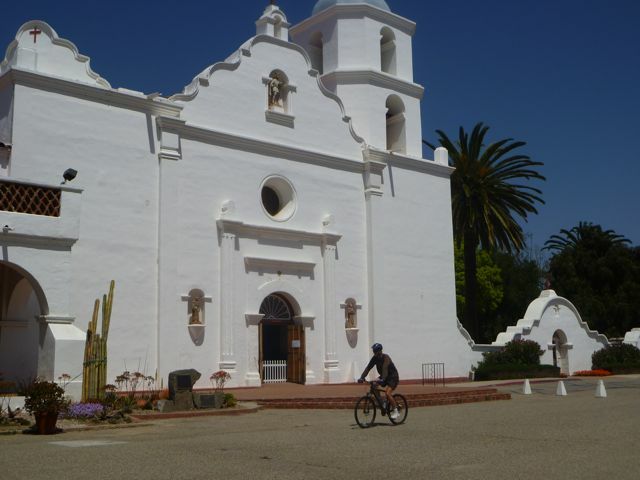 A highlight about halfway along the path is the Mission San Luis Rey de Francia, the largest in California, accessed via a detour south on Douglas Drive. 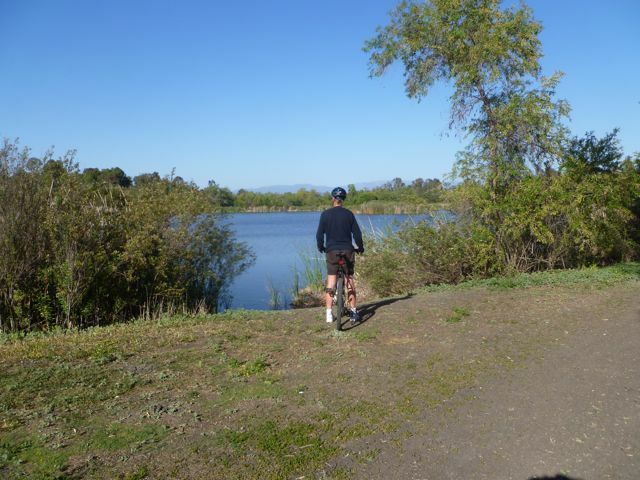 Guajome County Park, just past the east end of the trail, has camping, dirt trails, lakes, and facilities. Both dirt trails and highway bike lanes connect to the river bike trail. Mance Buchanan Park at College contains the only other facilities. The delta near the southwest trailhead is a beautiful tidal region with plenty of shore birds to watch. 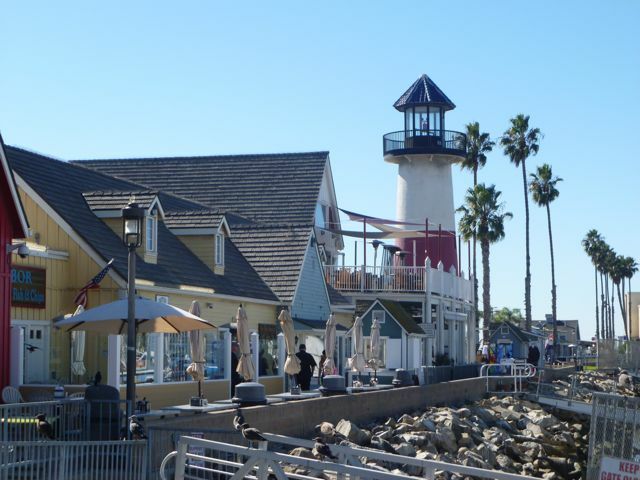 Oceanside Harbor and its enticing nautical village is a great place to stop for a meal on your ride, and then perhaps cycle the 1.5 mile road around the harbor. 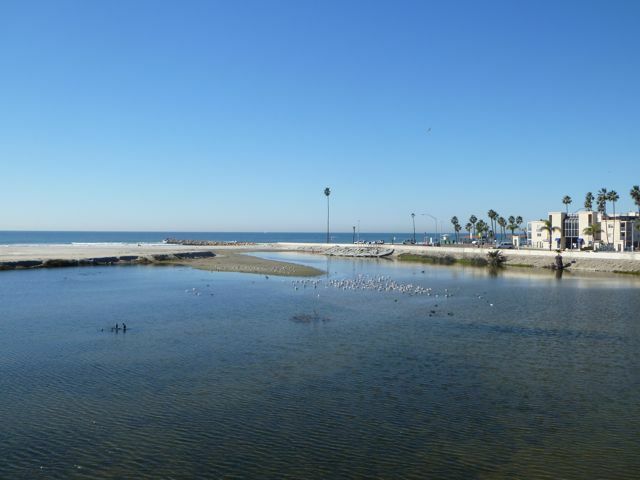 Saving the most scenic for last, you can take Class II Pacific Street south, and make a right on Breakwater that leads to The Strand along Oceanside’s beautiful beach and pier. The 2-mile ride along the beach is best done when not crowded because of the odd mix of one way slow vehicle traffic and two-way bike lanes. On a beautiful day, though, the cruise is worthwhile, along the wide sandy beach, and under the pier. From the beach you can take Surfrider or Seagaze up the hill to Pacific Street to access the downtown core with its restaurants centered around Tremont and Mission. 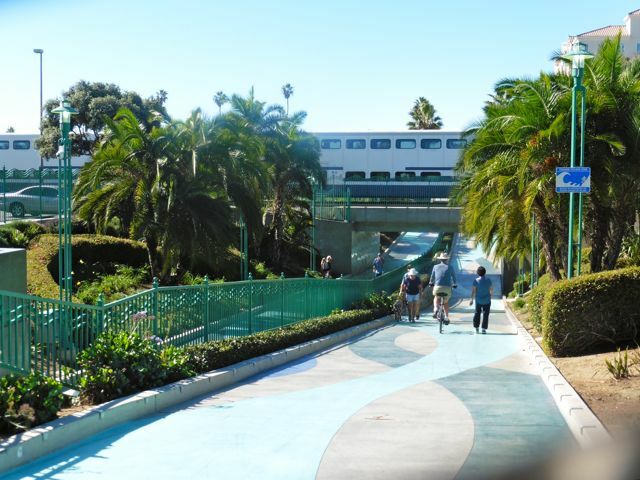 Another important feature of Oceanside is its transit center, located downtown south of Seagaze. 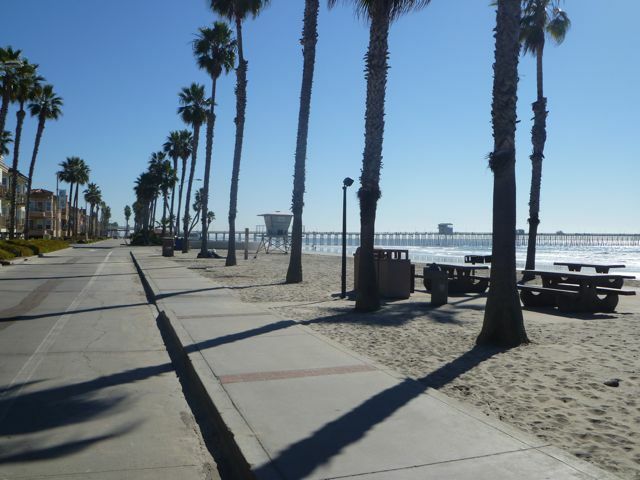 Four rail lines converge here – Amtrak’s Surfliner, LA’s Metrolink, and San Diego County’s Coaster and Sprinter, creating great opportunities for one way rides north to San Clemente or south along the San Diego County coast. A unique downtown bike-ped rail underpass. A popular cycling event in Oceanside is Bike the Coast – Taste the Coast with 100-50-25-15-7 mile options, held in early October.